ID Card Ribbons, 5 Panel Full Color (YMCKO) Ribbon, 200 images. The ribbon is used to print in a variety of colors: yellow (Y), magenta (M), cyan (C), and black (K). The remaining overlay (O) provides an extra layer of protection for the card. This ribbon is used to print text and full color images on one or both sides of the card. Compatible with Primacy, Zenius and Elypso ID Card Printers. ID Card Ribbons, 6 Panel Full Color (YMCKO-K) Ribbon, 200 images. The ribbon is used to print in a variety of colors: yellow (Y), magenta (M), cyan (C), and black (K). The remaining overlay (O) provides an extra layer of protection for the card. The second (K) allows for black printing on the back of the card. This ribbon is used to print text and full color images on one side and black on the back side of the card. Compatible with Primacy ID Card Printers. ID Card Printer Ribbons, 5 Half-Panel Full Color (YMCKO) Ribbon, 400 images. The ribbon is used to print on half of the card in a variety of colors: yellow (Y), magenta (M), cyan (C), and black (K). The remaining overlay (O) provides an extra layer of protection for the card. This ribbon is used to print text and full color images on one or both sides of the card. Compatible with Primacy and Zenius ID Card Printers. ID Card Ribbons, Metallic Silver Monochrome Ribbon, 1,000 image prints per roll. The ribbon is used to print in Metallic Silver only. This ribbon is used to print one color on one side of a card. Compatible with Elypso, Zenius and Primacy Printers. ID Card Ribbons, White Monochrome Ribbon, 1,000 image prints per roll. The ribbon is used to print in White only. This ribbon is used to print one color on one side of a card. Compatible with Zenius and Primacy Printer. ID Card Printer Ribbons, Genuine "Globes" Hologram Varnish Ribbon, 400 Prints per roll. Special "Globe" hologram provides an extra layer of security for your card. 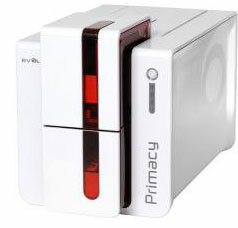 Compatible with Elypso, Primacy, and Zenius ID Card printers. ID Card Ribbons, White Signature Monochrome Ribbon, 1,000 image prints per roll. The ribbon is used to print in White only. This ribbon is used to print one color on one side of a card. Compatible with Zenius and Primacy Printer. ID Card Printer Ribbons, BlackFlex Monochrome Ribbon, Specirfic ribbon for print on ABS, PET, PC, special varnished, rough surface, and paper cards. 1,000 prints/roll. Compatible with Zenius, Primacy, and Elypso Printers Printers. ID Card Ribbons, Metallic Gold Monochrome Ribbon, 1,000 image prints per roll. The ribbon is used to print in Metallic Gold only. This ribbon is used to print one color on one side of a card. Compatible with Elypso, Zenius and Primacy Printer. ID Card Ribbons, Green Monochrome Ribbon, 1,000 image prints per roll. The ribbon is used to print in Green only. This ribbon is used to print one color on one side of a card. 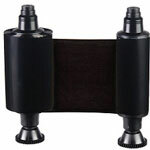 Compatible with Zenius and Primacy Printer. ID Card Ribbons, Red Monochrome Ribbon, 1,000 image prints per roll. The ribbon is used to print in Red only. This ribbon is used to print one color on one side of a card. Compatible with Zenius and Primacy Printer. ID Card Ribbons, Blue Monochrome Ribbon, 1,000 image prints per roll. The ribbon is used to print in Blue only. This ribbon is used to print one color on one side of a card. Compatible with Zenius and Primacy Printer.